American baking in Cornwall: baking powder biscuits | Notes from the U.K. This entry was posted in Food, Recipes and tagged American food, Americans in Britain, Americans in England, anglophile, baking, Britain, Cornwall, England by Ellen Hawley. Bookmark the permalink. I’m not sure why I’m committed to the rolled version, but I am. It’s something far beyond any sort of rational decision. I don’t think I ever saw a drop biscuit when I lived in the South. Plus you only see rolled biscuits in restaurants. I love them like that, but am inherently lazy. Drop biscuits are quicker and I don’t make as much of a mess. I should’ve said that you can also pat them out instead of roll them. But they do still make more of a mess than drop biscuits. What do I know, though? You’ve got a Texan saying you make better biscuits than Momma, and I usually just whack a can on the counter edge and bake (don’t tell my grandma). I’m sworn to silence on the subject. What was you grandma’s phone number again? Crap, I didn’t really mean to hit enter on that. It’s an evil conspiracy that backspace is an eight of an inch away from enter. It’s funny, but I’ll delete it if you like. Now that’s the way to live. And they taste better when baked in cast iron, as most things do. I’ve tried to make biscuits many, many times before but I’m white and from New England, so I don’t think it’s ever going to happen. I’m living proof that it’s neither genetic or geographical. On the other hand, if you’ve lived this long without them and there’s no pressing need…. So I guess I’ll have to blame my culinary ineptitude, then. (Actually, I’m not culinarily inept. My cooking skills, like my romantic ones, lie in the ‘gifted amateur’ range of accomplishment). Sounds pretty good, on both counts. Glad to have this confirmed. Now, please write a post about “pudding” and the differences between the UK and North America. My first experience of pudding was from a box labelled “Jello” – which, as I write this, I realize is a point of confusion, too! I’m not sure I’m brave enough to wade into this controversy, but I’ll consult an expert or six and see if it’s doable. Today is off to an excellent start! I might even be inspired to make biscuits. Word wasn’t impressed with scone-y and is still sulking. Word doesn’t care much for creative grammar either. Rather inflexible don’t you think? I prefer to think of it as unimaginative. I love both types of biscuits. Yum. As with all American vocabulary, I always fail to remember to use the word “cookie” but I do enjoy eating them. My husband loves biscuits with sausage meat gravy. Cheesy biscuits are delectable. So I’m a biscuit convert too. I used to substitute milk mixed with lemon juice for buttermilk back home in Scotland. I never thought to use vinegar though it’s obviously the same science. Now – after this discussion – I need to build biscuit baking into my day…. Now you’ve gone and made me hungry. Jeez, I’m British, and you’ve confused the life out of me! haha Seriously though, yes we do call what is eaten with cheese biscuits sometimes, but not so often – the only example I can think of is a digestive, which we would occasionally eat with cheese (however we much prefer crackers). The UK – US baking terms always get me scratching my head – I have asked my American friends several times what a biscuit is, and I am yet to have a straight-forward answer! I’m happy to add to the confusion anytime I can. I’d love to know what your American friends have told you. hah! Thank you – as if I need more confusion in this increasingly forgetful head of mine! I can’t actually remember anything concrete – that’s how waffley they were! How sad. I was hoping you could increase the muddle. And you, sitting there in the heart of biscuit country. As a Canadian, my world became a better place when I discovered American (baking soda) biscuits. They don’t exist up here in the Great White North! I’ll be keeping this recipe close by. (I don’t understand the gravy addition to biscuits for breakfast though). Biscuits and gravy are as traditional as biscuits and honey, and maybe more so. In Wild Thing’s family, the gravy was red eye gravy (see my answer to Next Step to Nirvana for a description). If you think of biscuits as a quick bread, it begins to make sense. Or maybe not if you’re not originally from the Biscuit Zone. I don’t eat them that way myself, but then I’ve already established that I’m an outsider. Yeah, that is a problem. But as long as you’re willing to eat whatever you turn out to have asked for, it’ll be fine. Hahaha! I loved this post for many reasons, not the least of which is that I’ve made hockey pucks, I mean biscuits, before. To get them just right is nirvana. And as we say in the south (well, central Florida, anyway), it ain’t easy. Don’t even get me started on Cuban bread. A friend deliberately made hers into hockey pucks when she was a kid. It was that or end up being the permanent biscuit maker till she left home. It was from her story that I learned about using as little liquid as you can. I grew up in India and so biscuits mean cookies and crackers, yes! But I live now in the US and my son loves biscuits and gravy, which he discovered during our travel to Texas! I would love to try this recipe. Biscuits and honey – heaven on Earth! Michiganders love da biscuits!! I won’t argue, but me? I prefer them with just butter. Biscuits are popular in New England, but not as much as in the south for sure. Bob Evans restaurant chains have a nice biscuit, but there is none like homemade. It’s true, the less you work the dough the better and the sharper your cutter the better. They are very rustic. I didn’t know that about sharp cutters. That means using a glass is an act of desperation, but it does work. I’ve read that if you twist the cutter you end up with slanted tops. 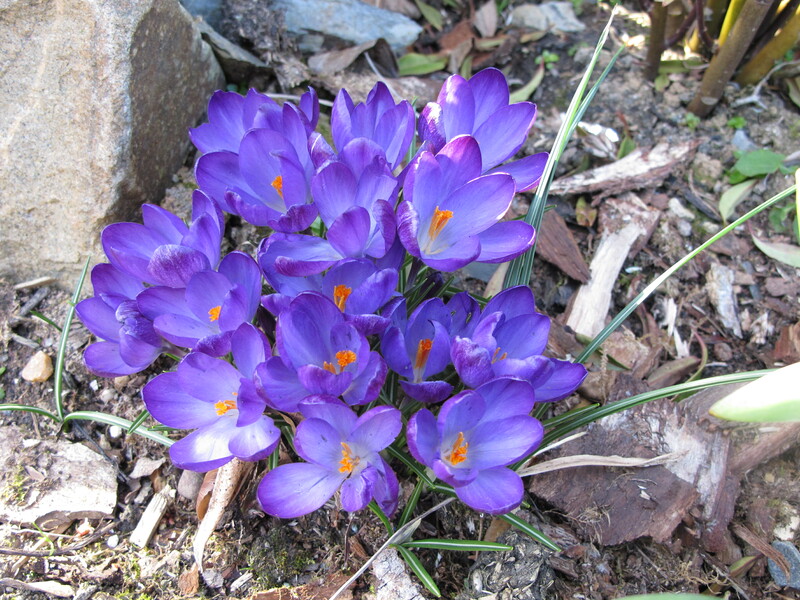 First of all, lovely purple croci! And I began to smile as I read about biscuits.. When I’m with my British friends, I always have to remember that a biscuit is far different than my first thought… Buttermilk and flaky biscuits for breakfast! PS: you’re from NY? Where exactly? Cheers and thanks for the recipe! I lived in what was then called Yorkville (now gentrified and called the Upper East Side, thank you very much) till I was eleven, when we moved a block and a half north of the city line, to Yonkers. Very much so. And although I love Cornwall, I always do miss New York. My family and I love baking soda biscuits. When I was growing up my mom would sometimes save the extra flour required to roll them and would instead drop them on a baking sheet. She called them “dropped biscuits” or “cat’s head biscuits” because they looked a bit like that. And although we grew up in the northern US with honey or fruit preserves, she also introduced us early to biscuits and red-eye gravy, and hominy grits. I’m hungry now. Have a great day and thank you for sharing! That kind of cooking could take the sting out of a northern winter. I’m a Yorkshire girl, and we have gravy on Yorkshire puddings (now there’s an art form I’ve never mastered). I’ve seen biscuits on US films and have always wondered how anyone could have the time to bake bread rolls for breakfast. Now I know they don’t! There’s nothing as sweet as cheating when it turns out something as good as biscuits. I’ve never heard of baking soda biscuits before. this looks like a great recipe. Thanks for including a good buttermilk substitute, too. I’m glad to have been included in it.